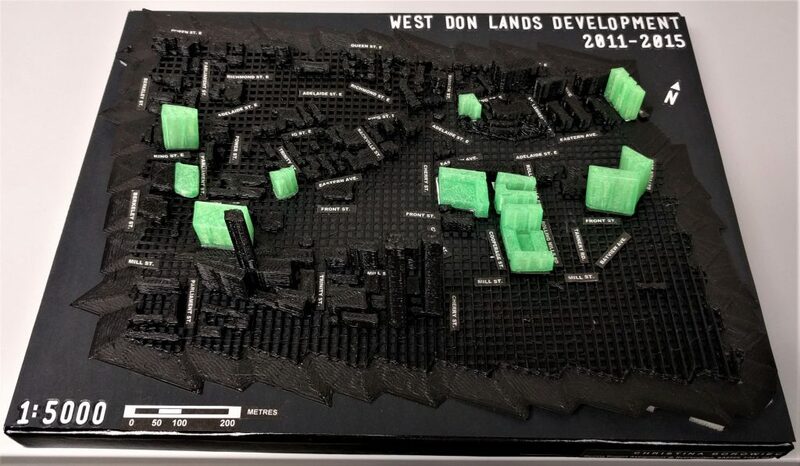 CHRISTINA BOROWIEC | West Don Lands Development: 2011 – 2015 | 3D Printing Tech. The model displayed above is of the West Don Lands of the City of Toronto, bounded by Queen St. E to the north, the rail corridor to the south, Berkeley St. to the west, and Bayview Ave. to the east. In utilizing Ryerson University’s Digital Media Experience Lab’s three-dimensional printing technology, an interactive model providing a tangible means to explore the physical impact of urbanization and the resultant change in the city’s skyline has been produced. The model interactively demonstrates how the West Don Lands, a former brownfield, have intensified from 2011 to 2015 as a result of waterfront revitalization projects and by serving as the Athletes’ Village for the Toronto Pan Am/Parapan American Games. Buildings constructed during or prior to 2011 are printed in black, while those built in 2012 or later are green. In total, 11 development projects have been undertaken within the study area between 2011 and 2015. Each of these development projects have been individually printed, and correspond to a single property on the base layer, which is identifiable by the unique building footprint. The new developments can be easily attached and removed from the base of the model (the 2011 building and elevation layer) via magnetic bases and footprints, thereby providing an engaging way to discover how the West Don Lands of Toronto have developed in a four year period. By interacting with the model, the greater implications of the developments on the city’s built form and skyline can be realized and experienced at a tangible scale. Areas with the lowest elevation (approximately 74 m) are solidly filled in on the landscape grid, while areas with higher elevations (80 m to 84 m) have stacked grids and foam risers added to better exaggerate and communicate the natural landscape. These additions can be viewed in the video below. Street names and a north arrow are included on the model, as well as both an absolute and traditional scale bar. The absolute scale of the model is 1:5,000. To complete the project, a mixture of geographic information system (GIS) and modeling software were used. First, the 3D Massing shapefile was downloaded from the City of Toronto’s OpenData website, and the digital elevation model (DEM) for Toronto was retrieved from Natural Resources Canada. Using ArcMap, the 3D Massing shapefile, which includes information such as the name, location, height, elevation, and age of buildings in the city, was clipped to the study area. Next, buildings constructed prior to or during 2011 were selected and exported as a new layer file. The same was done for new developments, or the buildings constructed from 2012 to 2015, with both layers using a NAD83 UTM Zone 17N projection. Once these new layers were successfully created, they were imported into ArcScene. In ArcScene, the digital elevation model for Toronto was opened and projected in NAD83. The raster layer was clipped to the extent of the 2011 building layer, and ensured to have the same spatial reference as the building layer. Next, the DEM layer properties were adjusted so base heights were obtained from the surface, and a vertical exaggeration was calculated from the extent of the DEM in the scene properties. Once complete, the “EleZ” variable data provided in the building layers’ shapefiles were used to calculate and display building heights. The new developments 3D file was then exported, as the 2011 buildings and DEM files were merged. Since the “EleZ” (building height) variable was used rather than “Z” (ground elevation) or “Elevation” (building height from mean sea level), the two layers successfully merged without buildings extending below the DEM layer. The merged file was then exported as a 3D file. Although many technical issues were encountered at this point in the project (i.e. the files failed to merge, ArcScene crashed unexpectedly repeatedly, exported file quality was low…), the challenges were overcome by viewing online tutorials of users who had encountered similar issues. Once the two 3D files were successfully exported (the new developments building file and the 2011 building file merged with the DEM), they were converted to .STL file types and opened in AutoDesk Inventor. Here, the files were edited, cleaned, smoothed, and processed to ensure the model was complete and would be accepted in Cura (3D printing software). 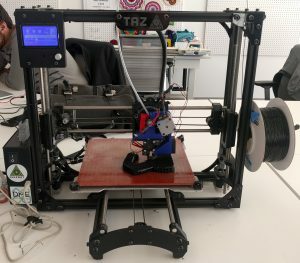 At Ryerson University’s Digital Media Experience Lab, the models were printed using the TAZ three-dimensional printer (pictured below). Black filament was used for the 2011 buildings and DEM layer, and green was used for the new developments. These colours were selected from what was currently available at the lab because they provided the greatest level of contrast. In total, printing took approximately 7 hours to complete, with the base layer taking about 5.5 hours and the new developments requiring 1.5 hours. The video above reveals the printing process. No issues were encountered in the utilization of the 3D printer, as staff were on-hand to answer any questions and provide assistance. Regarding printing settings, the temperature of the bed was set at 60°C, and the print temperature was set to 210°C. A 0.4 mm nozzle was used with a 20% fill density. The filament density was 1.75 mm, and a brim was added for support to the platform during printing. Although the brim is typically removed at the completion of a print, the brim was intentionally kept on the model for aesthetic purposes and to serve as a border to the study area. Once printing was completed, the model was attached to a raised base and street names, a north arrow, legend, absolute scale and scale bar, and title were added. Magnets were then cut to fit the new development building pieces, and attached both to the base layer of the model and the new developments. As a final step in the process, the model’s durability and stability were tested by encouraging family and friends to interact with the model prior to its display at the Environics User Conference in Toronto, Ontario in November 2016. To improve the project, three enhancements are recommended. First, stronger magnets could be utilized both on the new development pieces and on the base layer of the model. In doing so, the model would become more durable, sturdy, and easier to lift up to examine at eye level – without the worry of buildings falling over due to low magnetic attractiveness resulting from the thicker cardboard base on which the model rests. In relation to this, stronger glue could be used to better bind the street names to the grid as well. Additionally, the model may be improved if a solid base layer was used instead of a grid. Although the grid was intended to be experimental and remains an interesting feature which draws attention, it would likely be easier for a viewer to interpret the natural features of the area (including the hills and valleys) if the model base was solid. The last enhancement entails using a greater variety of filaments in the model’s production to create a more visually impactful product with more distinguishable features. For instance, the base elevation layer could be printed in a different colour than the buildings constructed in 2011. Although this would complicate the printing and assembly of the model, the final product would be more eye-catching. City of Toronto. (2016, May). 3D Massing. Buildings [Shapefile]. Toronto, Ontario. Accessed from <http://www1.toronto.ca/wps/portal/contentonly?vgnextoid=d431d477f9a3a410VgnVCM10000071d60f89RCRD>. Natural Resources Canada. (1999). Canadian Digital Elevation Data (CDED). Digital Elevation Model [Shapefile]. Toronto, Ontario. Accessed from <http://maps.library.utoronto.ca/cgi-bin/datainventory.pl?idnum=20&display=full&title=Canadian+Digital+Elevation+Model+(DEM)+&edition=>.